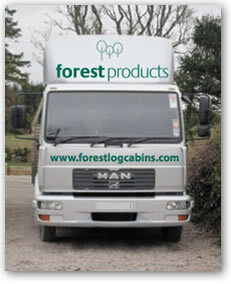 At Forest Products we have our own vans and lorries to deliver your building. We can safely deliver any building up to approx 7.5 metres in length with our own transport. If your building is larger than this we would arrange suitable transport via a third party. This could be either an artic lorry or possibly a large lorry fitted with a crane. 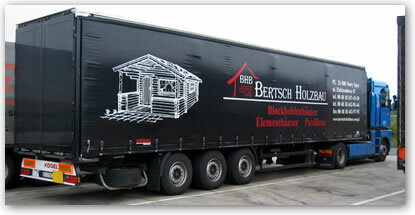 If the delivery is on our vehicles, then the building is usually lifted off by hand on-site. This gives our fitters ample oppurtunity to lay the various parts out in the correct positions to enable a speedy build. If you are constructing the building yourself then you will find our drivers are very knowledgable, they will happily give you some guidance on which bit is for where and what you need to get started. If your building is a large building, above 10 metres in length, then you must be sure that an artic size lorry will be able to get to your site. Generally it will be equipped with a crane or rear mounted forklift and will lift the pallets off directly to the side of the truck. If there is no direct access then we can usually work something out but we would need to know up front. If you are building the cabin yourself but need to store it for a while, then we strongly recommend keeping it as dry as possible by re-using the plastic sheeting it is packed in or maybe even adding some other tarpaulins. The buildings go together much easier if they are dry as the wood swells when it is wet making the corner joints very tight. We are happy to store your building for a short period of time at our site if you are not ready for it but all responsibility for it would be down to you. We would not recommend long term storage outside. To discuss delivery options or any other part of the process please call us on 01330 860505.